There is no doubt about the scale of the Alps, being both beautiful and breathtaking. With much of it covered in ice over 10,000 years old, from the last ice age, and huge intimidating seracs, it gives you more to think about when planning and travelling safely through them. 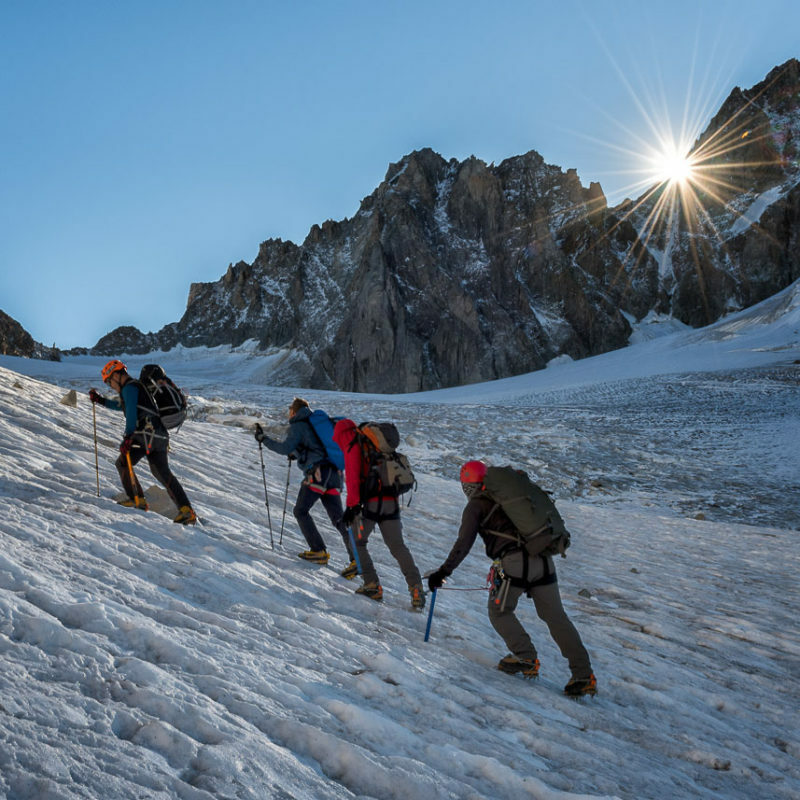 A lot of climbers and mountaineers travelling from the UK and Ireland seek reassurance in going into the Alps by choosing to employ the services of a guide, removing an element of decision making and planning. I offer services in all aspects of alpine mountaineering. Whether you want to tackle your first 4000m peak, fancy a family ascent of Mt Blanc, some sunny alpine rock climbing or something steeper and more committing for the experienced alpinist, I can tailor for your needs and work with you to create a bespoke package and help you and your friends or family realize your alpine ambitions! 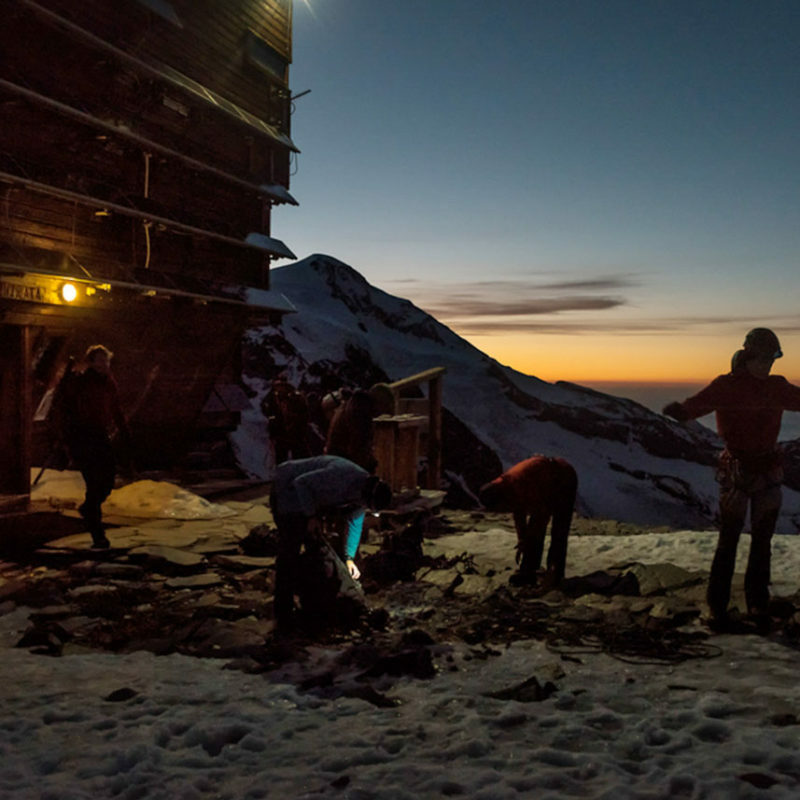 The secret to alpine clothing is versatility, as a standard day starts pre-dawn in the cold and finishes in the heat of the day. Mountain boots: Stiff leather boots are better all round. La Sportiva Nepal Extremes style boots are great. Ideally try and make sure they have been used a lot and are comfortable before the trip. The boots should be B2 rated as a minimum, but B3 is better. Gaiters: I prefer short ones for Alpine summer use as you are rarely in deep snow. Trousers: Soft shell type stretch fabric is best, fleece is too warm. No cotton. Waterproof over trousers: I go light, anything made from Paclite is great but heavier stuff will work just as well. Thermal top: Light colours are best as they reflect the sun. A Soft Shell Jacket to use while moving actively through the mountains. A light, medium or heavy weight down jacket is a good idea for mountain trips. Mont Blanc can be very cold at anytime of the year so medium/ heavy would be my recommendation. Waterproof Jacket and Trousers. Light is good for the alps. Gloves: A thick pair and a thin pair. Its worth having mitts for Mont Blanc and high mountain trips. Hat: A sun hat and a warm hat that will fit under a helmet. Sun cream Factor 30+ and Factor 30+ lipsalve. Belay plate, crab, a couple of slings and crabs are also useful. Air Tech Racing saves weight when climbing. Rucksack 35-40 litres should do. Water bottle at least 1 litre. I bring a flask as well in June and Sept.
Insurance – bring the documents or a copy with you.